← May I invite myself? Sled dogs to the rescue! Rudolphâ€™s nose light is worn out, and Nome, Alaska, the last stop on Santaâ€™s round-the-world delivery run, is socked in with a bad snowstorm. The good children of Nome must have their toys. But who will deliver? Santa remembers a grown-up boy named Tom, a dog musher who lives on the Iditarod Trail. He alights on Tomâ€™s roof to ask a favor: Could Tom and his team take it from here? 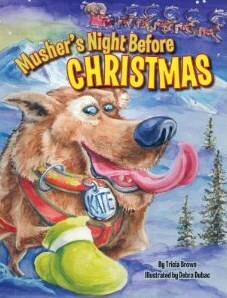 Here’s a brand-new book for Christmas 2011, featuring a clever dog musher and his team of champions. Up in lead position is Tom’s favorite, Kate. Come along on the wild Christmas Eve ride! Fans of The Itchy Little Musk Ox will recognize the distinctive illustration style of Alaskan artist Debra Dubac, whose paintings breathe life into these characters. I’ll be touring in Illinois, Indiana, Oregon, and Alaska this fall, reading this wonderful twist on the old classic. If you’d like me to visit your library, school, or bookstore, check out “The Places I’m Headed” and drop me a line! This entry was posted in Alaska Books for Children, Uncategorized. Bookmark the permalink.